Thomas Loftin was the son of James Loftin and Susannah Sherrill. He was born about 1798 in Lincoln County, NC. 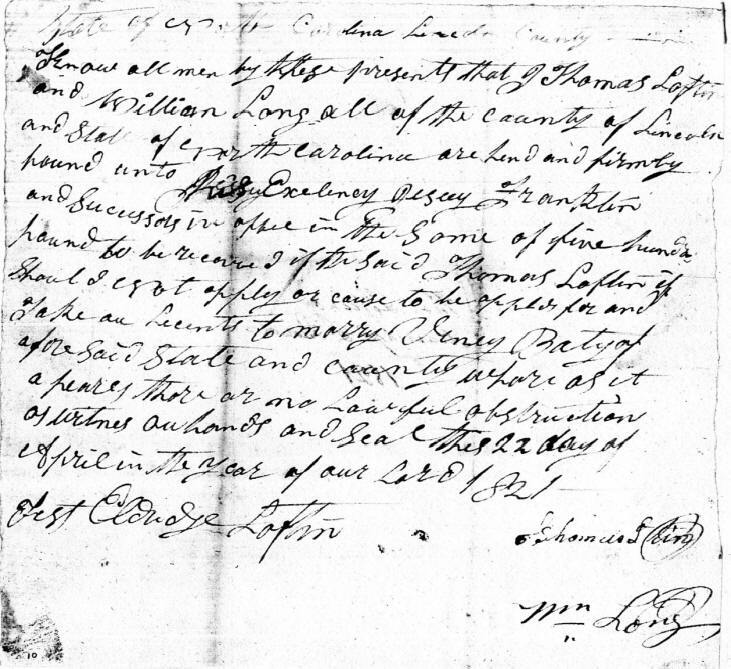 There is a Lincoln County marriage bond dated 22 April 1821 for Thomas Loftin’s marriage to Viney Baty. William Long was the Bondsman and Eldridge Loftin was the witness. Sally/Sarah Lavinia “Viney” Beatty was the daughter of William Able Beatty and Isabella McCorkle. Viney was born 12 Jan 1798. There are several different spellings for "Beatty" on historical records - including Beaty and Baty. * Some genealogists list 1853 as the death date for Elizabeth "Betsy" Salina Loftin Cook. Betsy was also listed on the 1860 Census. The Death Certificate of Betsy & Albert Cook's daughter, Mary Ann Cook Huffman, confirms that Salina was her mother - and not Albert's second wife, Mary Ann Styles, as many believe. Since Mary Ann Cook Huffman was born about 1857, Salina's death date must be after 1853. 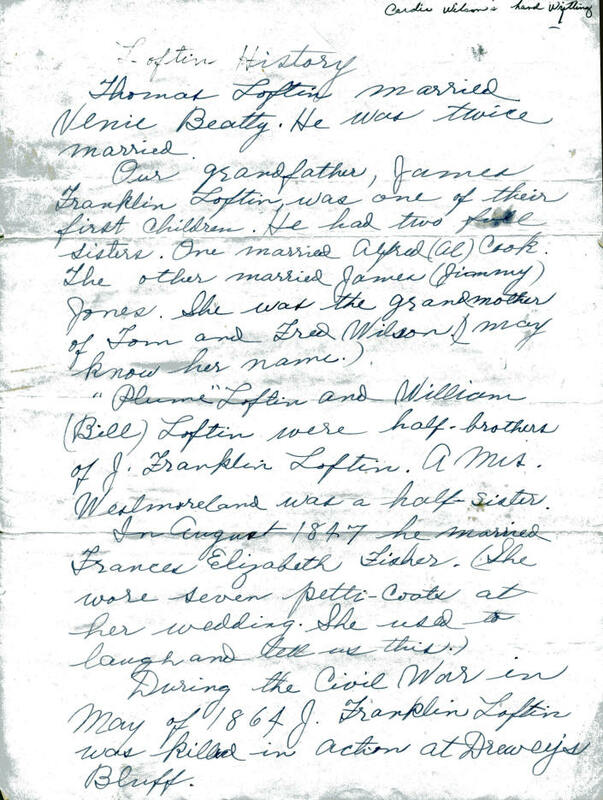 Genealogist John L. Cook from San Antonio, Texas, in a letter dated 09 May 1973 confirms that Albert & Salina Loftin Cooks Children were: Sarah Jane (b.1849), James Monroe (b.1850), France/Francis (b.1853) and Avery (b.1862). Although not listed in this 1973 letter, Mary Ann Cook Huffman (b.1857) would have been a daughter of Salina & Albert, as well as Etta Cornelia Cook (b.1860). Sarah/Sally Lavina "Viney" Beatty Loftin died on 30 May 1829 in Lincoln/Catawba County, NC, at the age of 31. Was her youthful death the result of illness or did she die in childbirth with Betsy? According to the 1830 Lincoln County Census, there were 3 living in the Thomas Loftin home, 1 male under 5 years of age (James Franklin), 1 female under 5 years of age (Elizabeth Salina) and a male between 30 - 40 years old (Thomas). There is no indication where Isabella Caroline was living - more than likely with other relatives. She would have been about 7 years old. After Viney's death, Thomas married Margaret Fisher in 1830 or 1831. Margaret was about 10 years younger than Thomas. At the present, there is no knowledge who her parents. From the 1850 Catawba County Census we deduce that she was born about 1808. 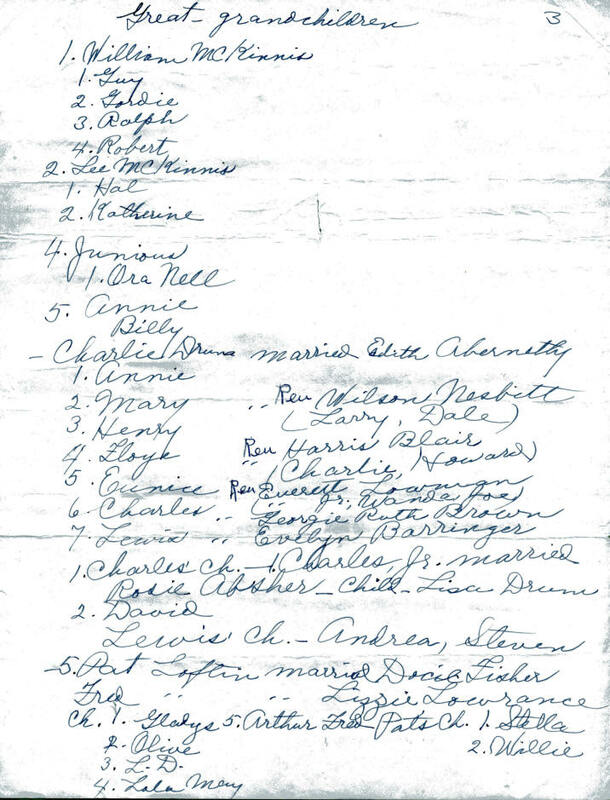 Thomas and Margaret's marriage produced at least seven children. *** The 1850 Census indicates that Eli was 9 years old, meaning he would have been born in 1841. "The Catawba County Soldier" says he was born in 1845. 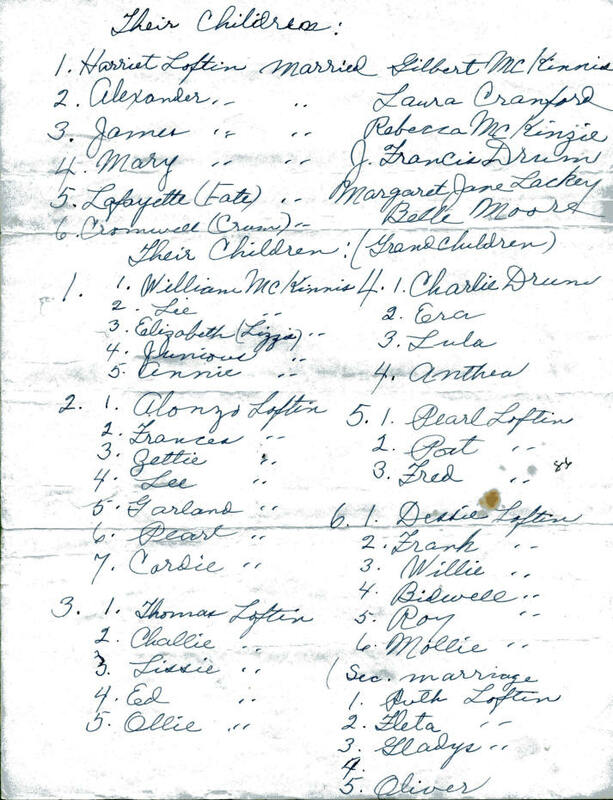 According to the 1840 Lincoln County Census (becoming Catawba County in 1842), there were 7 living in the Thomas Loftin home, 1 male under 5 years of age (Jackson), 2 males between 5 -10 years old (William A. and David), 1 male between 30 - 40 (Thomas), 1 female under 5 years of age (Martha Ann), 1 female between the age of 5 - 10 (Sally L), and 1 female between 20 - 30 years old (Margaret). There is no indication where Thomas' three older children by his first marriage (Isabella "Ebba" Caroline, age 17, James Franklin, age 13 and Elizabeth "Betsy" Salina, age 12) were living. In 1842 the northern third of Lincoln County became Catawba County. According to the 1850 Catawba County Census, Thomas was 53 and Margaret was 42. The couple had seven children living on the family farm - William (age 17), David (age 16), Sally (age 15), Martha Ann (age 13), Jackson (age 11), Eli (age 9) and William (age 6). His children from his marriage to Viney were all out of the family home. His Real Estate was listed as $200. William " 17 M "
David " 16 " "
Martha Ann " 13 "
* Eli A. " 9 "
The 1850 Catawba County Agricultural Census gives us some additional information about Thomas and his family. He had 20 acres of "Improved Land" - meaning land that had been cleared for the family home and for farming. He also had 165 acres of "Unimproved Land" - probably still a wooded area with trees. He had 2 horses, 1 milk cow and 14 swine/hogs - with 10 bushels of wheat, 20 bushels of oats and 200 bushels of Indian corn (the multi-colored corn that frequently shows up in Fall Centerpieces and wreaths". Corn does not grow wild anywhere in the world. This domesticated plant evolved through human intervention and is a form of wild Mexican grass. Originally cultivated in the Americas, corn was brought to Europe by Christopher Columbus in the late 1400s; thanks to other explorers and traders, it soon made its way to much of the rest of the globe. In America, the early colonists learned how to cultivate it from the Indians, for whom it was a dietary staple. Indian Corn, or flint corn, is one of the oldest varieties of corn, a type that Native Americans taught the early colonists how to cultivate. Its kernels, which come in a range of colors including white, blue and red, have “hard as flint” shells, giving this type of corn its name. Indian/Flint corn kernels contain a small amount of soft starch surrounded completely by a larger amount of hard starch, which means the kernels shrink uniformly when drying and are dent-free and less prone to spoiling (and therefore ideal for autumnal décor). Despite its tough exterior, this type of corn can be consumed by livestock and humans, and is used in such dishes as hominy and polenta. Thomas Loftin died prior to 1860. The exact date is currently not known. According to the 1860 Census, Margaret was living in Catawba Station with her sons Andrew age 19 and (William) Pinkney age 17. Her age is listed as 40. On the 1850 Census, however, her age was listed as 42. When the Civil War broke out, three of Thomas Loftin & Margaret's sons enlisted in 1861. According to The CATAWBA SOLDIER, William Loftin enlisted 6 Jun 1861 at the age of 28 and was part of the 23 Regiment - Company F, along with his brothers Pinkney and Eli. The CATAWBA SOLDIER further states that William died on 20 Oct 1861. Other sources say that William was part of the 23rd Regiment, Company A where he served as a Private, and was present April thru December 1862. He was sent to the hospital Sept 12/Oct 12 1862 and died 03 Dec 1862 in Catawba County. Pinkney Loftin enlisted 6 Jun 1861 at the age of 17 (or 18) and was part of the 23rd Regiment - Company F where he served as a Private. Captain Hilton of the 23rd Regiment gives Pinkney's death as 15 Sep 1861 of disease near Manassas, and states that back pay was due his heirs. Pinkney owed $7.25 for clothing and the final settlement to Pinkney's mother, Margaret Loftin, was made 12 Nov 1864 for $54.91. Monthly pay for a soldier a the time was $11. Eli Loftin was also a Private in the 23rd Regiment - Company F. According to some sources his age was 16. Other sources show his age to have been 19. He was shot in the knee 1 July 1863 at the Battle of Gettysburg and his left leg was amputated to the thigh. He lay on the battlefield several days and nights, not being moved until after the battles of Gettysburg were all over. The leg, however, was removed by a surgeon on the field. Eli spent the next year in various hospitals. He was admitted to Camp Letterman USA Hospital in Gettysburg on 08 Aug 1863; transferred 03 Nov 1863 to General Hospital in Baltimore, MD; moved to the hospital at Point Lookout, MD on 12 Jan 1884; admitted to Chimborazo Hospital, Richmond, VA on 04 May 1864. He was finally exchanged and admitted to the Salisbury, NC hospital in December 1864. James Franklin Loftin entered the Civil War as part of the Confederacy on 03 Mar 1863 as a Private at the age of 35/36. He was killed in action near Drewry’s Bluff, VA., on 16 May 1864. Thomas' son David M. Loftin also served the Confederacy during the American Civil War. When war broke out David had married Rebecca (Unknown) and had a son named Thomas. David enlisted on 05 Jul 1862 at the age of 28 (some records say 19) in Caldwell died on 20 Sep 1863 at Chickamauga, GA.
Thomas and Elizabeth's daughter Sallie married John Watts. John enlisted in the Confederacy on 13 Mar 1862 at the age of 30. He died seven months later on 02 Oct 1862 at Jordan Springs, VA. He was buried in the Stonewall Confederate Cemetery in Winchester, VA.
What an extremely difficult time for this family with the death of four brothers and a brother-in-law. Thus is the price of war. Margaret Fisher Loftin died sometime before 1870.